Tanabata (Japanese: たなばた or 七夕, meaning "Evening of the seventh"), also known as the Star Festival, is a Japanese festival originating from the Chinese Qixi Festival. It celebrates the meeting of the deities Orihime and Hikoboshi (represented by the stars Vega and Altair respectively). According to legend, the Milky Way separates these lovers, and they are allowed to meet only once a year on the seventh day of the seventh lunar month of the lunisolar calendar. The date of Tanabata varies by region of the country, but the first festivities begin on 7 July of the Gregorian calendar. The celebration is held at various days between July and August. The festival was introduced to Japan by the Empress Kōken in 755. It originated from "The Festival to Plead for Skills" (乞巧奠, Kikkōden), an alternative name for Qixi,:9 which was celebrated in China and also was adopted in the Kyoto Imperial Palace from the Heian period. 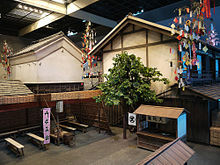 The festival gained widespread popularity amongst the general public by the early Edo period,:19 when it became mixed with various Obon or Bon traditions (because Bon was held on 15th of the seventh month then), and developed into the modern Tanabata festival. Popular customs relating to the festival varied by region of the country,:20 but generally, girls wished for better sewing and craftsmanship, and boys wished for better handwriting by writing wishes on strips of paper. At this time, the custom was to use dew left on taro leaves to create the ink used to write wishes. Incidentally, Bon is now held on 15 August on the solar calendar, close to its original date on the lunar calendar, making Tanabata and Bon separate events. The name Tanabata is remotely related to the Japanese reading of the Chinese characters 七夕, which used to be read as "Shichiseki" (see explanation about the various kanji readings). It is believed that a Shinto purification ceremony existed around the same time[further explanation needed], in which a Shinto miko wove a special cloth on a loom called a tanabata (棚機) and offered it to a god to pray for protection of rice crops from rain or storm and for good harvest later in autumn. Gradually this ceremony merged with Kikkōden to become Tanabata[further explanation needed]. The Chinese characters 七夕 and the Japanese reading Tanabata joined to mean the same festival, although originally they were two different things, an example of jukujikun. Orihime (織姫, Weaving Princess), daughter of the Tentei (天帝, Sky King, or the universe itself), wove beautiful clothes by the bank of the Amanogawa (天の川, Milky Way, literally "heavenly river"). Her father loved the cloth that she wove and so she worked very hard every day to weave it. However, Orihime was sad that because of her hard work she could never meet and fall in love with anyone. Concerned about his daughter, Tentei arranged for her to meet Hikoboshi (彦星, Cowman/Cowherd Star, or literally Boy Star) (also referred to as Kengyū (牽牛)) who lived and worked on the other side of the Amanogawa. When the two met, they fell instantly in love with each other and married shortly thereafter. However, once married, Orihime would no longer weave cloth for Tentei and Hikoboshi allowed his cows to stray all over Heaven. In anger, Tentei separated the two lovers across the Amanogawa and forbade them to meet. Orihime became despondent at the loss of her husband and asked her father to let them meet again. Tentei was moved by his daughter's tears and allowed the two to meet on the 7th day of the 7th month if she worked hard and finished her weaving. The first time they tried to meet, however, they found that they could not cross the river because there was no bridge. Orihime cried so much that a flock of magpies came and promised to make a bridge with their wings so that she could cross the river. It is said that if it rains on Tanabata, the magpies cannot come because of the rise of the river and the two lovers must wait until another year to meet. The rain of this day is called "The tear of Orihime and Hikoboshi". shaking away in the leaves. and there they will watch us. The original Tanabata date was based on the Japanese lunisolar calendar, which is about a month behind the Gregorian calendar. As a result, some festivals are held on 7 July, some are held on a few days around 7 August (according to the "One-Month Delay" way), while the others are still held on the seventh day of the seventh lunar month of the traditional Japanese lunisolar calendar, which is usually in August in the Gregorian Calendar. 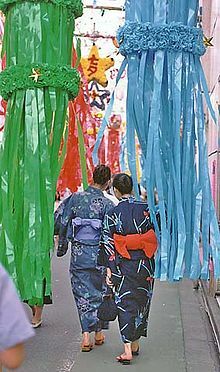 Large-scale Tanabata festivals are held in many places in Japan, mainly along shopping malls and streets, which are decorated with large, colorful streamers. The most famous Tanabata festival is held in Sendai from 6 to 8 August. In the Kantō area, two of the largest Tanabata festivals are held in Hiratsuka, Kanagawa (around 7 July) and in Asagaya, Tokyo immediately prior to the start of the Obon holiday in mid August. A Tanabata festival is also held in São Paulo, Brazil around the first weekend of July and Los Angeles, California in the beginning of August. 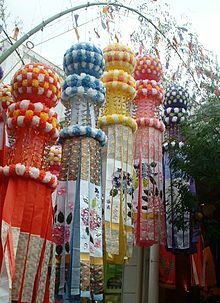 Although Tanabata festivals vary by region, most festivals involve Tanabata decoration competitions. Other events may include parades and Miss Tanabata contests. Like other Japanese matsuri, many outdoor stalls sell food, provide carnival games, etc., and add to the festive atmosphere. Tokyo Disneyland and Tokyo Disney Sea often celebrates the Tanabata Festival featuring a greeting parade with Minnie as Orihime and Mickey as Hikoboshi. The Sendai Tanabata festival is the most famous in Japan. Tanabata has been celebrated in the region since the time of Date Masamune (1567-1636) who was the first warlord of the Sendai area. The festival began shortly after the city was founded in the early Edo Period. The Tanabata festival gradually developed and became larger over the years. Although the festival's popularity started to dwindle after the Meiji Restoration, and almost disappeared during the economic depression that occurred after World War I, volunteers in Sendai revived the festival in 1928 and established the tradition of holding the festival from 6 to 8 August. During World War II it was impossible to hold the festival, and almost no decorations were seen in the city from 1943 to 1945, but after the war, the first major Tanabata festival in Sendai was held in 1946, and featured 52 decorations. In 1947, the Showa Emperor Hirohito visited Sendai and was greeted by 5,000 Tanabata decorations. The festival subsequently developed into one of the three major summer festivals in the Tōhoku region and became a major tourist attraction. The festival now includes a fireworks show that is held on 5 August. The ornamental ball (薬玉; Kusudama) often decorated above streamers in present-day Tanabata decorations was originally conceived in 1946 by the owner of a shop in downtown Sendai. The ball was originally modeled after the dahlia flower. In recent years, box-shaped ornaments have become popular alternatives to the ornamental ball. In 2008, the 34th G8 summit in Tōyako, Hokkaidō coincided with Tanabata. As host, Japanese Prime Minister Yasuo Fukuda invited the G8 leaders to participate in the spirit of the festival. They were each asked to write a wish on a piece of paper called tanzaku, to hang the tanzaku on a bamboo tree, and then to take the necessary actions to change the world for the better. As a symbolic gesture, the actual writing and the act of hanging up that note is at least a first step. The Japanese Ministry of Foreign Affairs made colored strips of paper and a bamboo tree for G8 wishes available in Roppongi during the summit. Protesting organizations in Sapporo during the G8 summit also tried to use the spirit of Tanabata to focus attention on a somewhat different set of wishes. Non-governmental organizations including Oxfam and CARE International set up an online wish petition campaign to coincide with the G8 Summit and Tanabata. Outside Japan, Fukuda's timely gesture had unanticipated consequences. For example, the Indian nationally circulated newspaper, The Hindu, picked up on this festival theme by printing an editorial featuring unconventional Tanabata wishes. Fukuda also invited his fellow citizens to try turning off the lights in their house and stepping outside to enjoy with their family the sight of the Milky Way in the night sky. On 7 July, the Japanese Ministry of the Environment anticipated that over 70,000 facilities and households across Japan would switch off their lights from 20:00 to 22:00 as a symbolic step and as a wish for the future. ^ Brown, Ju; Brown, John (2006). China, Japan, Korea: Culture and customs. North Charleston: BookSurge. p. 75. ISBN 978-1-4196-4893-9. ^ Sargent, Denny. Shinto and Its Festivals. ^ a b c d e f Hearn, Lafcadio (1905). The Romance of the Milky Way, and other Studies & Stories. Houghton Mifflin and Company. ^ James, Grace (1910). Green Willow and other Japanese Fairy Tales. Macmillan & Co. p. 65. ^ Kaneko, Sōshū (1984). きょうのおはなし なつ [Today's story: Summer] (in Japanese). Suzuki Publishing. p. 24. ISBN 4-7902-4005-3. ^ Rupp, Katherine (2003). Gift-giving in Japan: cash, connections, cosmologies. Stanford University Press. p. 140. ISBN 0-8047-4704-0. ^ Mishima, Shizuko. "Japanese Tanabata Festival". About.com. Retrieved 6 July 2011. ^ "MIT Japanese "culture-notes" – Song-Tanabata, July". Japanese Language and Culture Network. Massachusetts Institute of Technology. 5 March 2002. Retrieved 6 July 2011. ^ "Celebrate Disney Tanabata Days at Tokyo Disney Resort". Disney Parks Blog. Retrieved 4 February 2018. ^ "Sendai Tanabata Matsuri". Japan National Tourism Organization. Retrieved 5 July 2018. ^ "Sendai's Tanabata Matsuri: Four Centuries of Vivid Colors". Nippon Communications Foundation. 9 June 2018. Retrieved 5 July 2018. ^ Japan, Ministry of Foreign Affairs (MOFA): Schedule Archived 19 December 2008 at the Wayback Machine; Reuters (India): "Factbox – Schedule for G8 Summit and Surrounding Events News." 3 July 2008. ^ 2008 Japan G8 Summit NGO Forum. " About Tanzaku Action – One Million Wishes," Archived 20 July 2008 at Archive.today July 2008. ^ Saito, Mari and Sophie Hardach. "G8 leaders to wish upon a bamboo tree at summit," Reuters. 2 July 2008. ^ Japan, MOFA: "Setting up of the Public Relations Booth for the G8 Hokkaido Toyako Summit," 16 June 2008. ^ Oxfam: "Tanabata: Your wishes to the Summit!" July 2008. ^ Cooper, Andrew F. and Ramesh Takur. "Wishing on a star for the G8 summit," The Hindu (Chennai). 7 July 2008. ^ Japan, Prime Minister of Japan: "Before Tanabata, the Star Festival," Fukuda Cabinet E-mail Magazine No. 38 (3 July 2008). ^ "Lights to be turned off at 72,000 facilities on Tanabata night," Hokkaido Shimbun (Sapporo). 4 July 2008. Wikimedia Commons has media related to Tanabata.